Escape and relax abaord The Ghan to Adelaide. 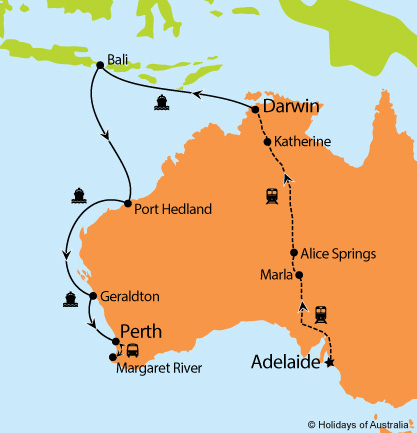 Explore the Top End before boarding Sea Princess to Perth. Relax in the comfort of rail travel on The Ghan. Explore Darwin at your own pace with a 48 hour Hop-on Hop-off pass. Cruise aboard Radiance of the Seas from Darwin to Perth. 6 night stay in Darwin at the DoubleTree by Hilton Esplanade Darwin including breakfast. 48 hour Hop-on Hop-off Big Bus ticket. Half day Jumping Crocs & Nature Adventure tour. Full day Litchfield National Parks & Waterfalls tour. Transfer from your hotel to the Darwin cruise terminal. 8 nights aboard Radiance of the Seas cruising from Darwin to Perth (Fremantle) with port calls in Bali, Port Hedland & Geraldton. Your cruise includes on board meals and entertainment. Transfer from the Fremantle cruise terminal to your hotel. Includes a Perth/Fremantle City Sights tour. 2 night stay in Perth at the Pan Pacific Perth including breakfast. Overnight Margaret River Wine Experience tour. Transfer from your hotel to the Perth airport.